"A new and intriguing messenger app and chat service for smart phones and PC"
Nimbuzz is the latest chat app available for your smartphone or even to download on your PC or mac desktop. It offers basically the same features as Whatsapp or Telegram and I could not find much to set it apart from those two leading names in the messaging app category. 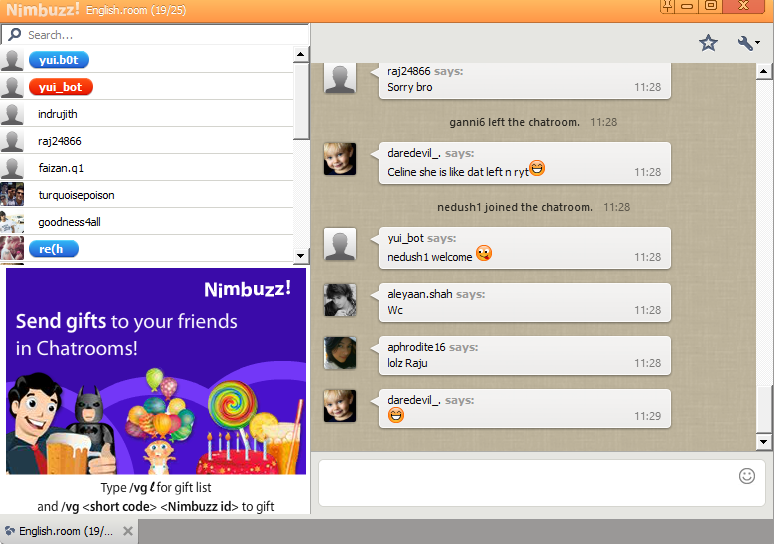 Nimbuzz does however have a chat room feature which the others don’t offer so it is possible to go online direct from the app and make some new friends but as with most online chat rooms they tend to be full of weird people. I did quite enjoy the trivia quiz that is run in some rooms to keep the chat flowing although due to the fact that Nimbuzz seems to be popular more with the Asian community than any other groups some of the questions were not in English making it very hard to participate. NImbuzz is free to download but with so many competitors in this market at the moment it does not have enough unique features to draw people away from the other more popular chat apps. You can link your other accounts such as Facebook etc to Nimbuzz and it does have one over on Whatsapp in that there is a desktop version available. It would be a very neat and tidy chat tool if it was at all popular in the western world, but as of yet it is relatively unknown. Perhaps in the future it may become as popular as the other apps I have mentioned but it will be a while before we are saying Nimbuzz in the same breath as Whatsapp or even Telegram.